Enza and Laura, two young ambitious seamstresses in The Shoemaker's Wife by Adriana Trigiani are delighted to find rooms at the relatively luxurious Milbank House in New York. This residence for single working women, Trigiani writes, was 'in the middle of a wide, tree-lined block of opulent homes, anchored by a lavish Episcoap church on the corner of Fifth Avenue and the charming Patchin Place houses across Sixth Avenue on the other, this block had character and whimsy, a rare combination in New York City at the turn of the progressive century.' This double brownstone with its formal library, parlour and 'deep garden' was a much nicer alternative to the many cheap and nasty lodgings which were the common lot of struggling girls away from home. I read that one shopgirl complained that there were 'six of us in the garret!' Milbank House was reasonably priced and breakfast and dinner were even included in the rent. . Enza loves her beautiful room bathed in sunlight at Milbank House with its fresh scent of lemon wax. But 'more important than all these lovely features of gracious living,' according to Trigiani, ' was the camaraderie of the young residents, who aspired to better lives on the wings of their talent and creativity. Finally, Laura and Enza were with like-minded peers, who understood their feelings and drive'. Milbank House, opened in 1919, was one of several houses run by the Ladies' Christian Union which decided to start building comfortable residences for single working women as far back as 1860 Seamstresses, shopgirls and factory workers were flocking to the city in search of better lives and they were often reduced to extremely poor living conditions and in serious danger of being compromised. Another house owned by the Ladies' Christian Union was Katharine House. This also had a library, a parlour and sewing machines for the residents. There was even a relief fund to help the sick go to hospital and those who had trouble paying for meals. Katharine House only closed in 2000. According to a New York Times article in 1997, many of the women living there were extremely pleased to find it. 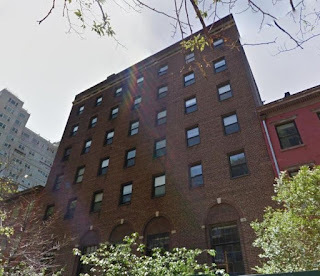 One ballerina had paid $600.00 a month for a 'rotten deal,' so she was amazed by the 'baby grand piano in the second-floor lounge, a terrace for summer socializing and maid service.' They didn't mind the rather Victorian rules - for example, men weren't allowed in the bedrooms and had to leave the beau parlours at 11;00 p.m.